The reason for writing the FP NavKit programs was the fact, that the CD-Drive on my Laptop quit service and my (expensive) Jeppesen CD would not work anymore. So these programs were written by myself to replace the Jeppesen CD. As some friends went by and mentioned that these programs would be useful for other FlightSimmers (including themselves) I decided to publish them. FP Index the starting program from which the others can be started. FP Maps the world with navigation and airports. Routes are possible. FP Airports shematic display of the choosen airport with taxiways and parking. The programs can be run individually and allow more than one instance (This is useful to start the departure airport and the destination airport in two instances of FP Airports.). FP Index allows only one instance. 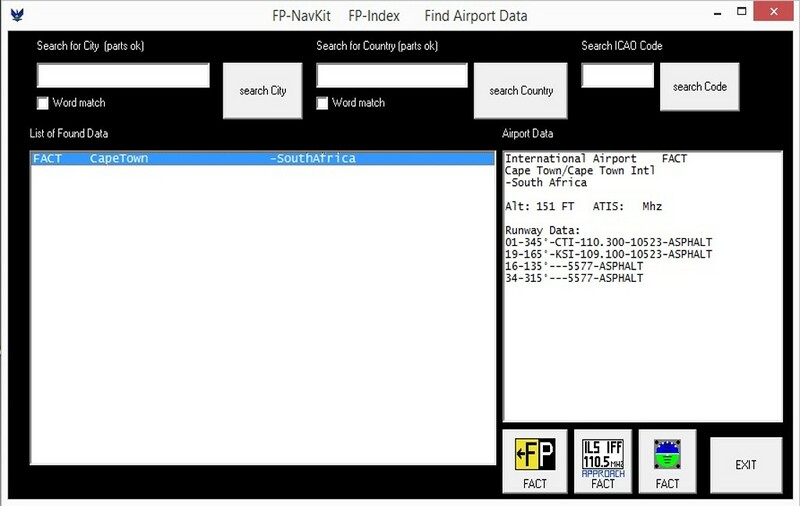 The FP NavKit is independent from the Flightsimlator, it contains all needed data. If you found your airport in FP Index, it makes sense to start FP Maps from here, because then FP Maps will mark your airport with a red circle in the startscreen (only with zoomlevel 5000). The programs of FP NavKit are optimized for a windows tablet and it makes sense to start them from FP Index, because the ICAO-Code input is not nescessary anymore. First I start FP Index, choose my airport and start FP Maps. 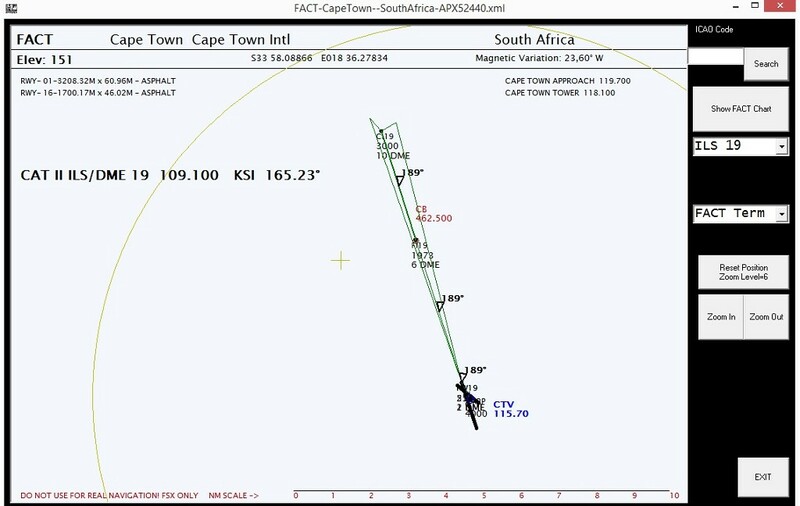 Here I plan my route to my destination and look for the estimated fuel for the flight to fill up my tanks in the FSX. 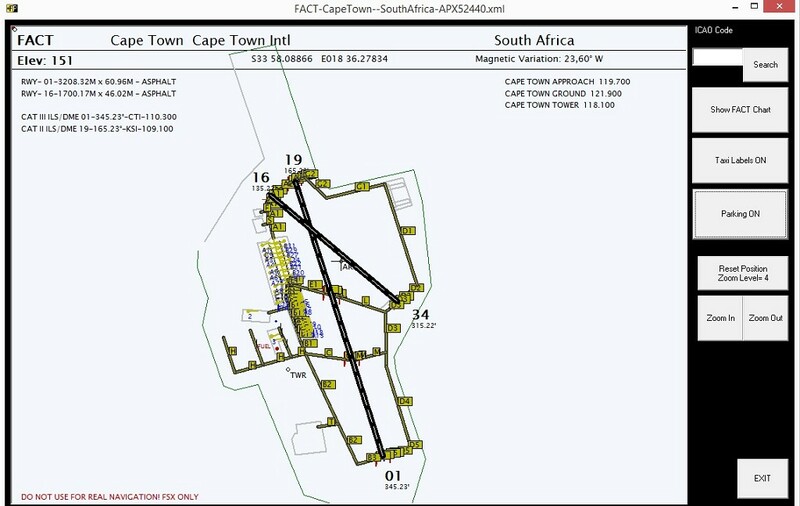 Then I start FP Airports from FP Index and check the taxiways to the take-off runway without the embarressing automatic taxi instructions. My flight is checked with FP Maps. Short after starting my descend, I start FP Index and go to my destination airport. With this FP Approach is next. The assigned approach is now on display. Note: FP Approach is still in the process and therefore it shows only the final approaches. If it is complete it will show also transitions to this finals. For taxiing to the gate I use FP Airports oncemore. Tip: if you fly with ATC you should always taxi to the assigned gate, otherwise on the next flight it will not be possible to fly with a flight plan. All data used by the programs are open. For FP Airports and FP Approach these are mainly the XML-files in the FSX-Files directory. All other data are in the simple text-format and can be changed with any text-editor, if the required format is followed. These text-files can be exported into Excel (who ever needs it?). All text-data, except RWY.nav, ILS.nav and COAST.nav, are extracted from the FSX. FP NavKit holds all nescessary data, so it is obvious that any FSX-add-ons are not displayed by the programs. There comes a simple tool, called FP Notes with FP NavKit. This tool is a simple touch-input, which allows you to write with your finger some information on it. The reason to make it were the long taxi instructions on large airports and no paper around. So i write it into FP Notes and follow them later. Simple but useful. FP NavKit is written in Visual Basic, oldfashion ok, but the first program was started in 2001 and i still kept the programming language. Windows itself will not recognize these programs, there are no DLL`s or Librarys not even traces in the registry. Therefore it is possible to start the programs from a memory stick. All programms are optimized for speed, although FP Airports with a big airport will take some time. The mass of data is enormous on big airports. One problem of automatic processed data are the labelconflicts. So please dont be sorry if you see some. Copy and unzip the file FP_NavKit_mmmyyyy.zip (mmmyyyy = version) into a directory (f.e. FP_NavKit). The “exe” files are ready to run. If you like do some links to the desktop.